If you have gotten hooked to the revolutionary disappearing-image app Snapchat, you’re not the only one! However, there is a fair chance that you belong to the group who have not yet utilised all of Snapchat’s hacks and tricks to take your online social life to the next level. For instance, if you don’t already know how to type more on Snapchat, you are losing out on a lot. The emergence of such recent walkthroughs has gone viral and here are a few ways in which you could be taking advantage of them! If your smartphone does not have one already, you can get a text editor from the app store. Anything like Apple’s Native Notes or Evernote will do just fine. Bear in mind that you cannot directly type into Snapchat’s text box so you will need another interface where you can add new lines and spaces. Alternatively, if you already have and/or use any of these applications, you may skip this step. Even your email would work; essentially any interface that lets you add lines and spaces will do. This is where the magic happens so pay close attention. Use the “enter” or new line button on your phone’s virtual keyboard to add the number of lines you want. You can add any number of lines as required because it is this space that will be used for your Snapchat text. Once you have completed doing that, select the entire space and copy it onto your clipboard. 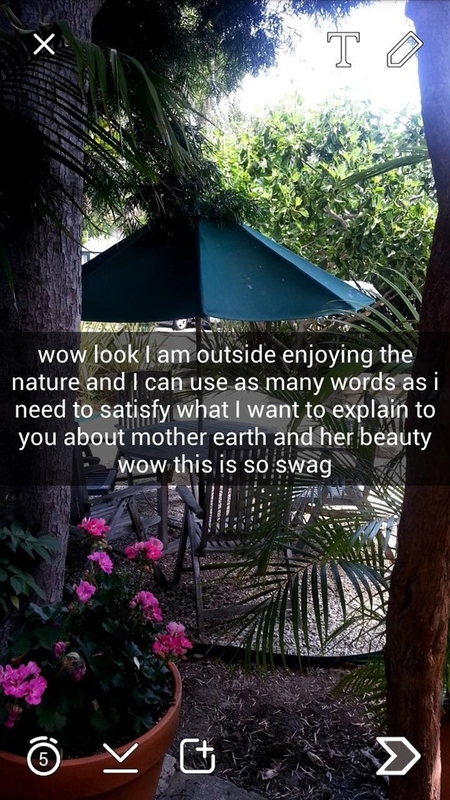 Be careful to not type any text in this space as Snapchat would count that into the character limit. Simply paste the selected portion inside the text box of your Snapchat. When you paste it, you will see the large empty space highlighted. You can now type long messages and say a whole lot more. People who know how to type more on Snapchat have a massive edge and are more popular than others who don’t because they can express a lot more with their posts. In case you have selected more space than you needed, you can simply use the delete or the backspace button to remove them. If you end up deleting too much by mistake, you can always paste the spaces that were stored on your clipboard in step 2. Simple! Spoiler alert! This hack only works for iOS, so you will need an Iphone for this. Now that you know how to type more on Snapchat, it is only natural that you would want to record more video than miserly 10 seconds that Snapchat provides. Well it looks like someone heard you! A recent hack has demonstrated how to make longer videos and it is very simple. Start off by heading to Snapchat and opening the video record page. Once there, follow the usual routine and hit the red circular button to start recording the video by holding down your finger on the screen as usual. However, here is where things get clever. Before your 10 seconds run out, hit your Iphone’s home button twice to return to the home screen. Note that this does not close Snapchat, just leaves it running in the background so that you are effectively multitasking. The “multitask” feature on Android does not allow this hack to work over there, sadly! You should be at your home screen by now, the one that has all the apps lined up. Scroll left to reach the recording window on your phone. You should see a video record happening and you can continue to film yourself for as long as you like (read: MUCH longer than 10 seconds). When you are done filming your escapades, just go back to Snapchat. Opening it again would terminate the video record but the bug on Snapchat would let you post your extended video without too much trouble. Okay, now the bad news. It has seen that when this is done, the video quality suffers although that is an okay-ish price to pay for getting a time extension. The deal breaker is, however, that you cannot send these long videos to friends. They will get cut by Snapchat’s 10 second limit. Normally, it would be impossible to record videos and have two hands free without having an extra arm. Fortunately, Apple fixes that issue for you with its “assistive touch” feature. This is your extra, invisible hand. To access this, go to settings and then follow up with “general” settings. Next, scroll down and touch the “accessibility” option. Once in there, look for the “assistive touch” option down below and touch it to turn it on. At this point, you should a small icon pop up on the right of your screen. Touch the “create new gesture” option to open the page. On the window titled “new gesture”, press and hold your finger firmly anywhere on the screen until the blue bar at the bottom fills up. When the bar is filled, hit the “stop” button. Your phone has now completed reading the gesture. Without closing the screen, tap the “save” option on the top right-hand corner. Enter the name with which you want the gesture to be saved into the appearing text box. Something like “Snapchat no hands” to make it distinctive. Once you have the gesture saved, head over to Snapchat to start recording the video. Before you do so, hit the “assistive touch” icon on the right of the screen and select your gesture in the menu option labelled “favourites”. At this point, a little circle (your gesture) should appear on the screen. Subsequently, put your finger over the centre of the record button. This will drag your gesture and the video starts recording. You now know how to record on Snapchat without holding the button! Server responsed at: 04/18/2019 2:25 p.m.